queen of hearts. — halthegal. 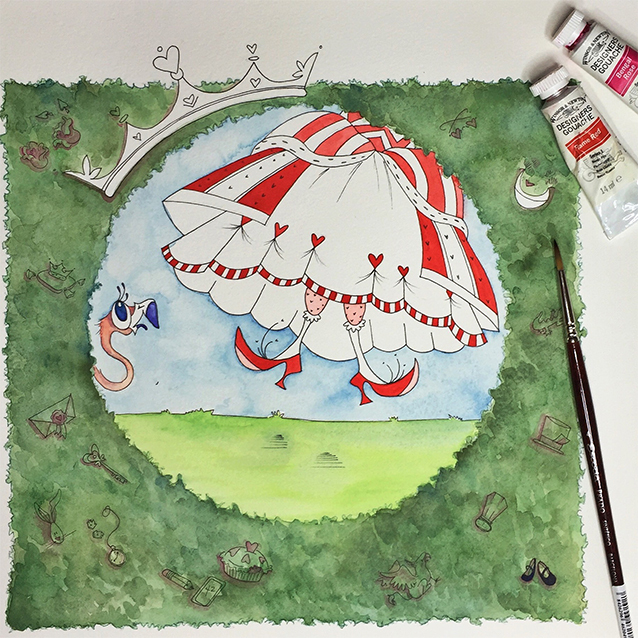 faerie tale feet painting inspired by the queen of hearts from alice's adventures in wonderland by lewis carroll. i have always loved “alice’s adventures in wonderland” as a terrific piece of absurdist literature. and what inspired this piece? a medieval painting i saw at the met one january on my husband's birthday trip. 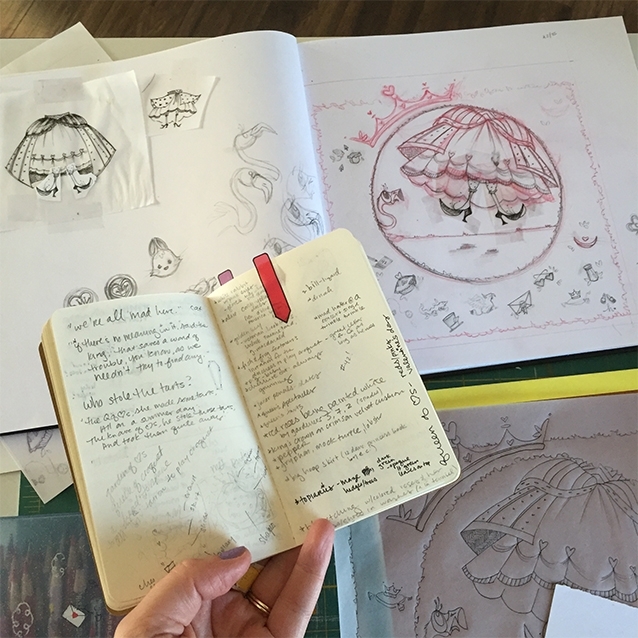 so here’s a peak into the process (& my absurd book collection) for lewis carroll’s classic! i found that i have more than 17 editions of lewis carroll’s alice stories. 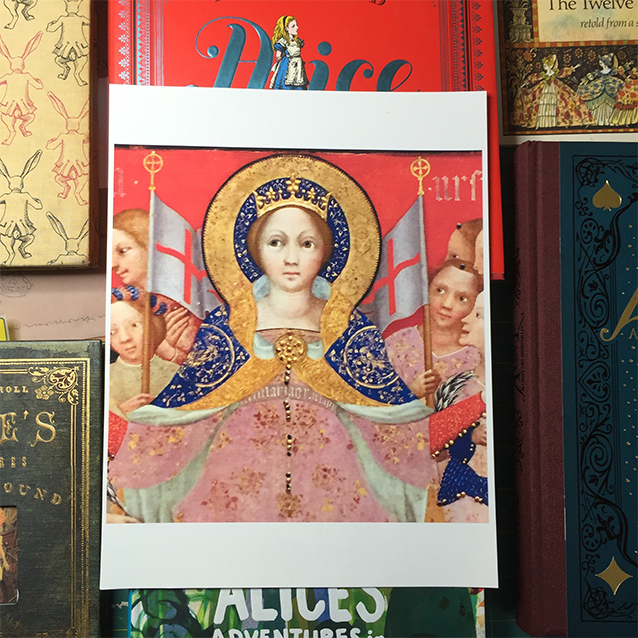 they range from comics to modern art, antique editions, the gorgeous new french edition by benjamin lacombe, and animation concept art by my beloved mary blair. artists have obviously found the text visually inspiring for its 150 years of existence. i’m sure the fun’s not over! here’s the medieval painting i found in the met this january that inspired the unique layout of this piece. i immediately thought of her bangs as the big hips of her skirts and thought since she’s always yelling “off with their heads!” the picture could be in the shape of her head. here’s my little quick sketch while i was in the museum. i usually doodle sculptures in oceana and the mayan rooms for their fantastic shapes, but there was something so graphic and modern about this piece that i had to capture the funky collar and that remarkable crown. 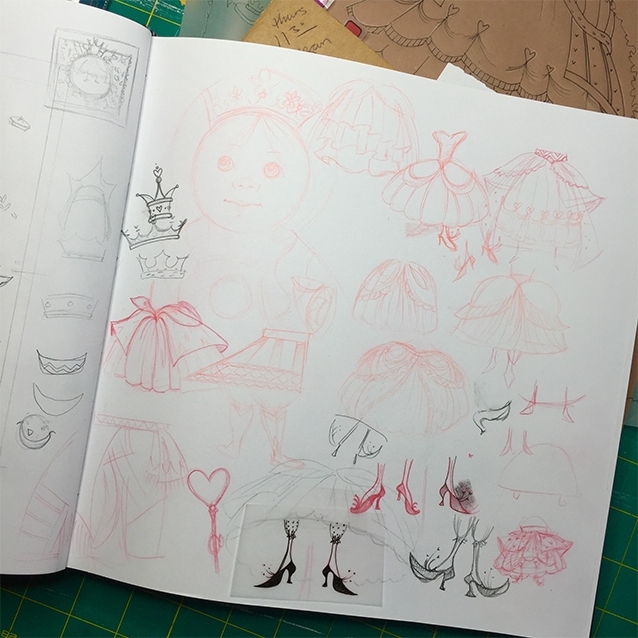 i got home and started doodling- ball gowns and shoes- and deciding what posture would BEST indicate she was HOPPING MAD! i take lots of little notes in my moleskin. and my countless alice books are riddled with sticky tabs for phrases or illustrations i want to reference. once i had my final sketch, i transferred it to watercolor paper and started painting in layers of green foliage for the hedges. the croquet match was the perfect opportunity to hide icons from the story in the topiary hedges. and i couldn’t resist putting in a startled flamingo croquet mallet! paint paint paint… oh, how i love to paint! i’m in love with this piece and hope you adore it, too! if it was anything like cherry pie, i don’t blame the knave one bit. but it did throw the queen into quite the tantrum. and of course, instead of showing “off with their heads,” i did a round head*shaped hole in the hedge instead. long live the queen and all the cards and critters the king of hearts spared. the original painting is available for $550 (+$40 for safe US shipping), already framed. please contact me if interested. purchase the limited edition signed prints HERE. & the greeting card HERE. and if you're a true wonderland fan, be sure to also check out the companion piece (the first ever faerie tale feet piece i did! ), "alice to a tea." & "a tempered heart" sticker! 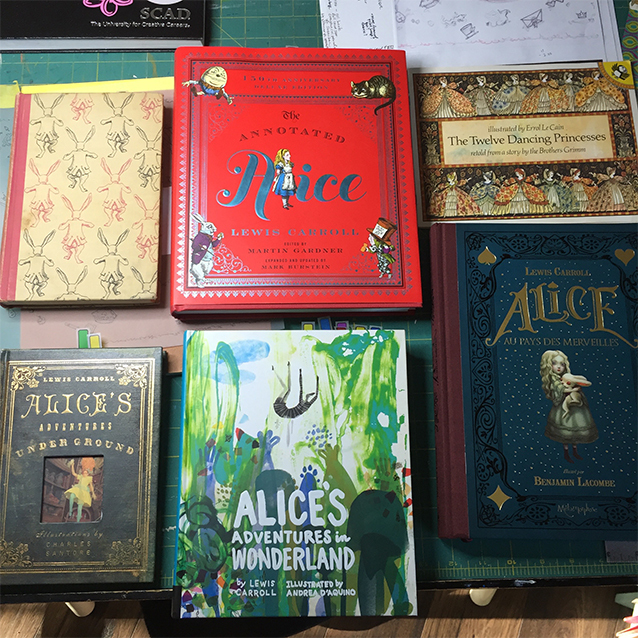 just a few of my alice editions. “alice adventures underground” was really interesting as it’s a printing of the original manuscript carroll gave to alice liddell, not how he edited it when people told him he should publish it. (he had to pay for his first print run, by the way. and tenniel was so unhappy with the plates from his etchings (the first and last children’s book the editorial cartoonist ever illustrated!) that he demanded a reprint. so they stamped them defective and shipped them to america. if you have that FIRST edition, oh how i envy you! !